Why hasn’t anyone mentioned how awesome the new Holy Pally cast animation is? A class finally casts spells straight out of a spellbook. I can only speak for myself but I haven’t mentioned it because I haven’t been able to see well enough to write anything longer than a tweet in weeks. Plus, I would likely never have known since I don’t play a Holy Paladin. Q4TQ: is there any advantage to using the new cloak heirlooms that you can buy with 7th Legion/Honorbound tokens over the old cloak heirlooms? I think it’s more that they provide options for people who didn’t like the other heirlooms because they had stats they didn’t want, or let you buy cloaks in current content instead of having to go back and get outdated currencies. D&D Call off! What’s your favorite fantasy race(s) to play in tabletop? Tiefling, Wilden, Pixie, and Dwarf here (strange, since I’m all elf-elf-elf in WoW). There are a lot of D&D races. My current PC is a Dwarf Barbarian named Rista, she’s a lot of fun, but she’s not even close to my favorite race. Just using current D&D 5e, I like Goliaths, Aasimar and Warforged. But I have in the past played a Bugbear, a Lizardfolk and a friend ran a one shot where I got to play a Vrykul, that was really fun. One of my favorite characters was a Mul (from the Dark Sun campaign setting) gladiator named Ashyr, who ended up a Fighter/Rogue whose combination of racial traits and class abilities (this was 2nd Edition, remember) made her simply ridiculous in a fight. I have fond memories. Q4theQ: With no judgement intended, have you found there are certain classes you prefer for certain genders? All of my characters are female, because…I don’t really know, actually, they just are. I think it is a model preference. But Hubby tends to have melee classes as males and caster as females. It isn’t intentional, he just noticed it the other day (he does this with Mass Effect as well, Female!Shep is Biotic, Bro!Shep is a soldier). And I’m just curious if other people find themselves doing this. I specifically chose my race and gender in RPG’s for aesthetic reasons and any story that I might be able to access. So I’ve been playing a Night Elf Warrior as my main since I retired my Draenei Warrior in Warlords of Draenor (he stayed on Alt Draenor for his retirement) and while my Draenei Warrior was male, my Night Elf Warrior is a woman because I think that Night Elf women look cooler. I tend to play lady Dwarves, Night Elves, Pandaren, Orcs and Blood/Void Elves, while I also tend to play male Draenei, Humans, Tauren and Worgen. Gnomes, I always go with ladies just for the hair options. Q4tQ: What elements of your favorite spec *should be* untouchably rooted in their concept? For example, I feel I should be safe counting on Affliction always being “souls and DOTs and shadow damage” based, and as a warlock I should always have a tank pet. If they broke one of those elements, I’d be… annoyed. I think we saw Blizzard settle a long standing debate among Fury Warriors that was introduced in Wrath of the Lich King and codified what is most iconic in the Fury Warrior — Fury Warriors use Titan’s Grip. 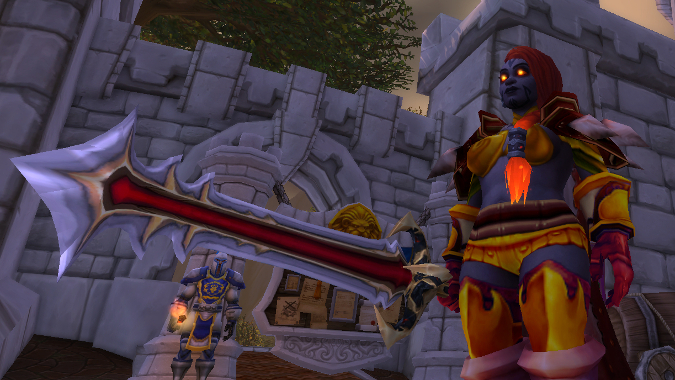 Despite the fact that Fury dates back to Vanilla and couldn’t even dual wield 2h weapons before Wrath, I feel like we tried to make Single-Minded Fury work over and over again and it never did — Titan’s Grip is and should be fundamental to the Fury Warrior, it’s how Fury differs from Frost DK’s, Rogues and Shaman. Some of my friends have been telling me I should roll a tank. But as a long time healer and DPS, I can’t understand why I would want things to hit me. What’s the allure of playing a tank? Well, I’ll be 100% honest — I feel a lot less motivated to tank in Battle for Azeroth than I did in the last two expansions. The changes they’ve made to threat mechanics and tanks in general haven’t exactly made me feel compelled to do it. But as far as the allure of tanking, I think it comes down to what kind of player you are, when you will be playing and who you’ll be playing with as much as what kind of content you’ll be doing. For myself, I very much enjoy taking for a group of people I know — I enjoy helping my group and keeping the enemies engaged and focused on me. I’m not really excited for tanking for pick up groups although I have done so in the past and I’m sure I’ll do so again in the future. Tanking in dungeons is different than tanking in raids, of course. Some players love tanking so they can control the pace, decide which target gets killed in what order, how the group progresses through the content. Others enjoy being extremely able soloists who can take on powerful epic mobs out in the world or pull large groups and come out without much of a health drop. I have friends who love tanking in all sorts of different situations — they’ll tank for PuG’s, they’ll tank LFR, they’ll tank Mythics, what have you. For myself, I enjoy tanking most when I pull off a clutch move that keeps me from dying or when I successfully juggle the many and varied demands of the content I’m engaging in. But it’s a stressful role, and if you’re a game perfectionist (as I am) it can be demoralizing to not quite manage to be as perfect as you want. A DPS player who doesn’t play their best just does less damage, but a tank who doesn’t excel dies. Okay, that’s the Queue for this Friday. It’s good to be back. I have spared you multiple pictures of my ruined, bloody eyeball and you should be grateful.